Gardening > Tips for a garden bursting with beauty! Tips for a garden bursting with beauty! 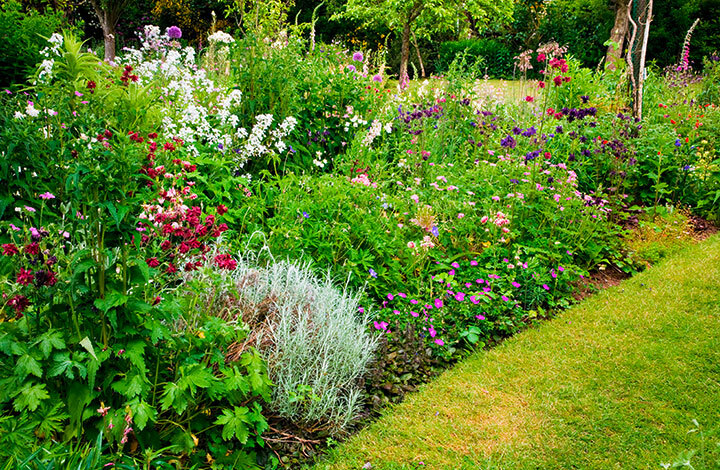 The warmer and longer days in May mean it’s prime time for planting up and sowing a new bed, brimful of beautiful plants – it’s got to be one of the most exciting garden jobs of the year. Soil is warmer and more moist, so it’s more likely your new plants will transplant better if done now. But where to start? It takes a bit of planning, but this is most definitely the fun part. First of all, decide on a range of plants that will see you through much of the year – frothy summer perennials are wonderful, but your beds will be bare through many months if you just stick to high-season flowers. For best effect, I like to pick up a host of evergreens and other shrubs that brighten up the garden at different times. For example, pop in some zesty lime euphorbias, frilly stout ferns such as our own native Polypodium vulgare, and a nice hardy buddleia bush or two – the brilliant variety ‘Bicolor’ has an unusual and splendid mix of purple, pink and orange blooms, loved by bees. These are just some of the many plants that can provide a structural backdrop – even deciduous buddleia stems can be left in place over winter. Next comes your choice of perennials that you can arrange through colour, scent and height, but do consider how much shade you have. Varying hues of green low-growing hostas and zingy pinky-red tall astilbes like shade, while towering delphiniums and front of border hardy blue geranium ‘Rozanne’ love to get some rays of sunshine. Self-seeders such as aquilegia and foxgloves do the hard work for you much of the time – spreading themselves about liberally! Tall sea hollies, eremerus and lupins will strike a pose at the back, while pretty low-growing aubrieta and thrift will bob sweetly at the front. And, of course, think about the colour palette you want to achieve – choose a heady rainbow of colours; or perhaps a blend of matching tones would suit you better. Getting your bed ready is key – just dig over and fork in compost to enrich where you’ll be planting. Place plants in their pots where you’d like them to go in the border and move them around to suit you. Dig a hole for each twice the depth of the root ball of the plant. Water well and then, for a neat touch and to retain moisture, spread bark mulch over the surface. It’s the perfect time to sow many perennials, annuals and biennials where they will flower now, too, so make room to incorporate these into your scheme. Enjoy your gardens this spring! Fully hardy and evergreen, with fiery red leaves when young and late-spring clusters of white bell flowers. Also tough, but with more attractive, mid-green leaves and unusual tumbling bunches of pink blooms.